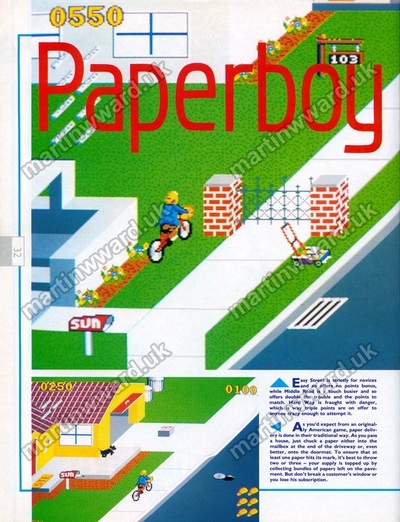 Paperboy for the Amiga is a licensed version of Atari's classic 1980s arcade coin-op game. 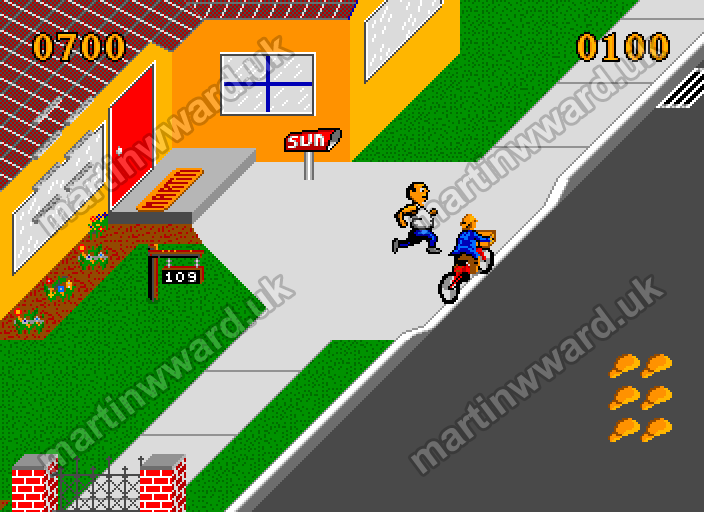 Pick up your old push bike, put on your peaked cap and imagine yourself braving the streets of an American suburb. Only superb riding skills and a steady throwing arm can get you through your seven day week of hilarious action. Avoid cars, workmen, drunkards and lawnmowers all out to obstruct you in your pursuit of excellence. Score points by delivering to all your usual customers, but you can get sneaky bonuses by breaking the windows of non-subscribers. It's a difficult task but your employer believes that practice makes perfect and generously provides a practice track where you can score valuable extra points. Get ready for the ride of your life. 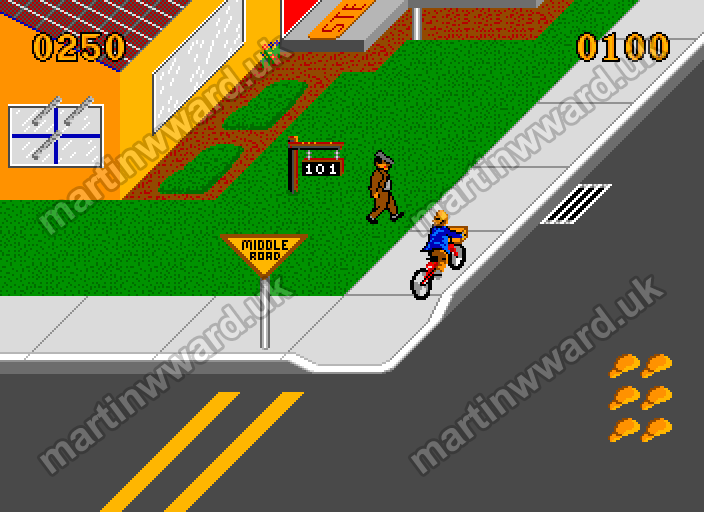 The player takes on the role of a bicycle-riding American newspaper delivery boy. 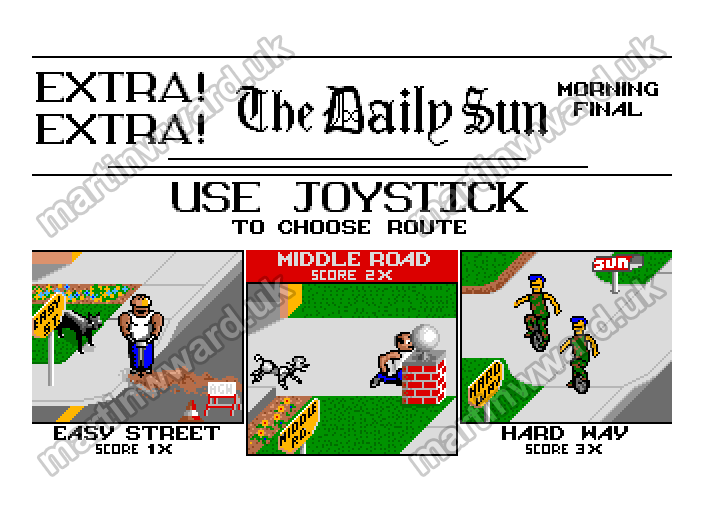 The game has a choice of three difficulty levels. 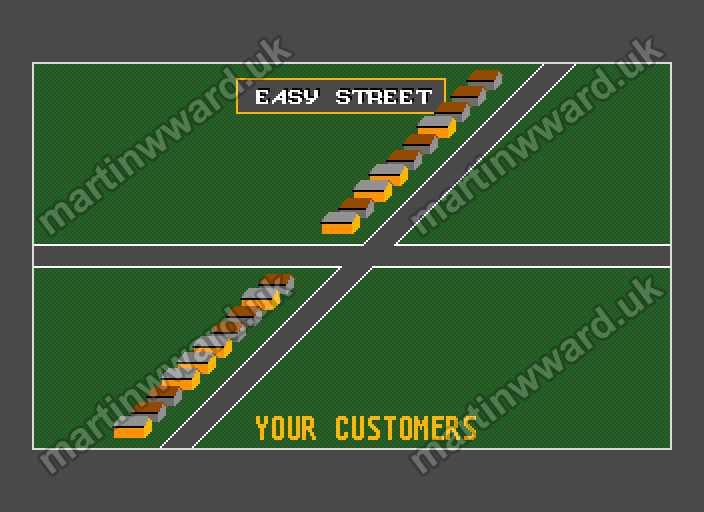 Easy Street - score 1x - an enjoyable ride for beginners. Middle Road - score 2x - a very playable game. Hard Way - score 3x - a challenging ride, for more experienced players. 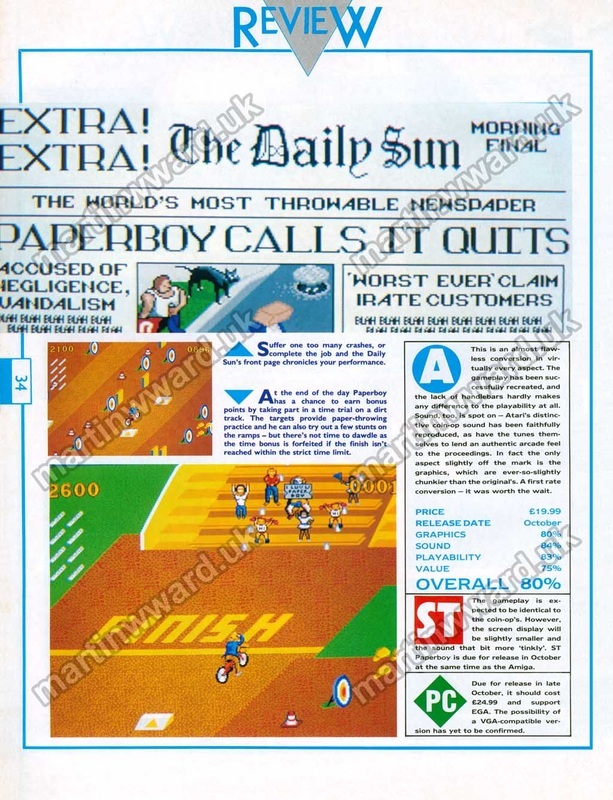 The object of the game is to successfully complete a week's paper round, scoring as many points as possible. 100 points are scored for the successful delivery of a paper into a mailbox or onto a doormat. 50 points are scored for picking up a bundle of newspapers - this also resets the number of papers the player has to eight. 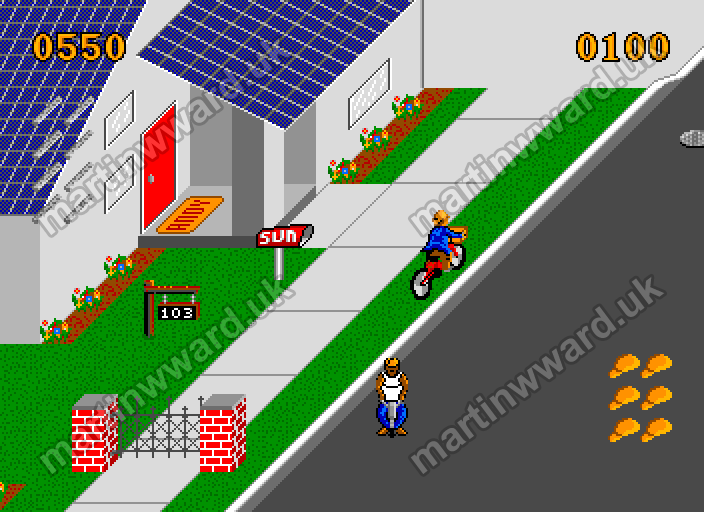 Bonus points are awarded for breaking windows, lamps and gravestones, and for knocking the lids off trashcans. 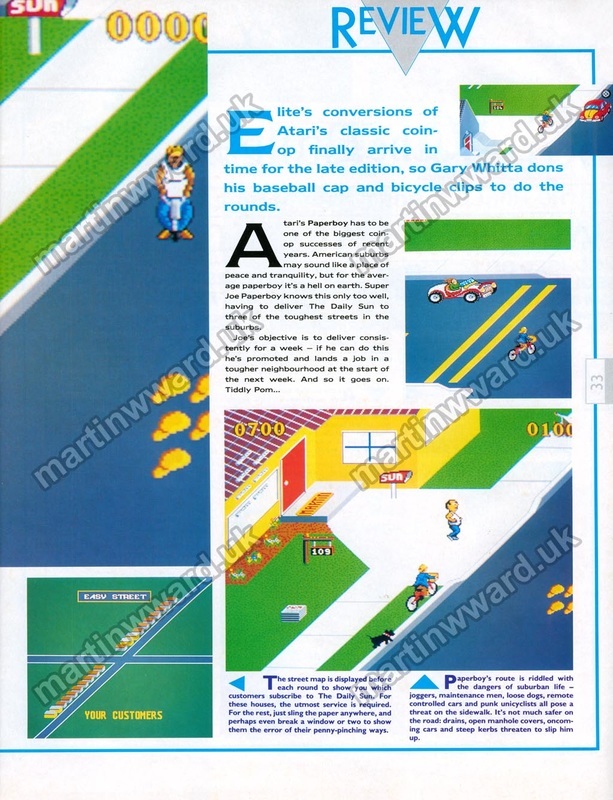 The player starts the game with 8 newspapers and 6 caps. A cap is lost every time the rider falls off the bike. The game ends when the player runs out of caps. 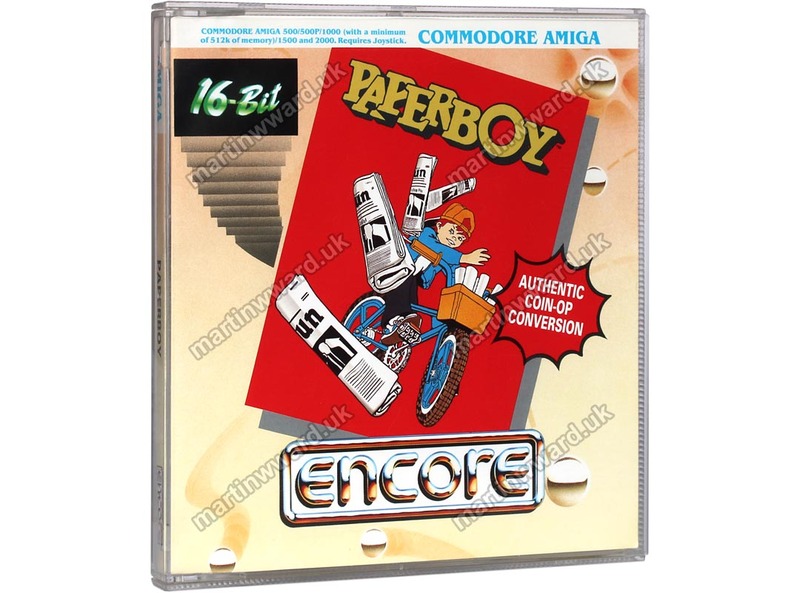 At the end of each day's paper round, the player has the chance to boost their score on the target course. 250 points are scored for hitting each target. If the player completes the target course in time, the remaining time is converted to bonus points and is added to the points total. Failing to deliver a paper to a subscriber's house, results in a cancelled subscription - that house will not be available for delivery on the next day's round. 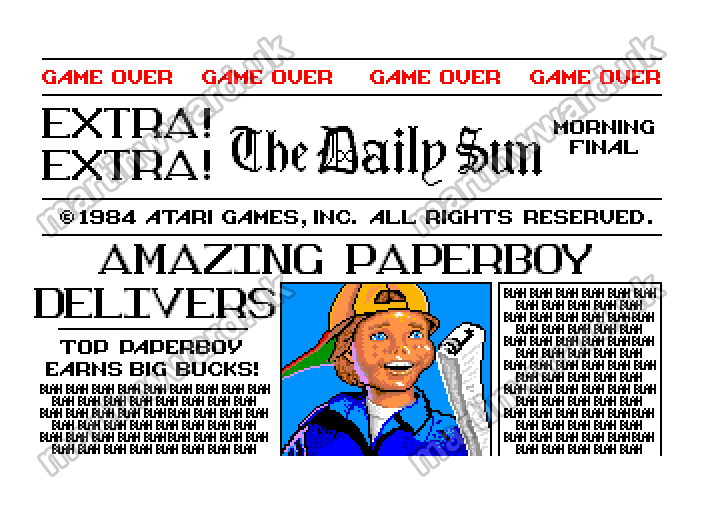 A perfect delivery is scored if a paper is delivered to every subscriber (each house with a mailbox). 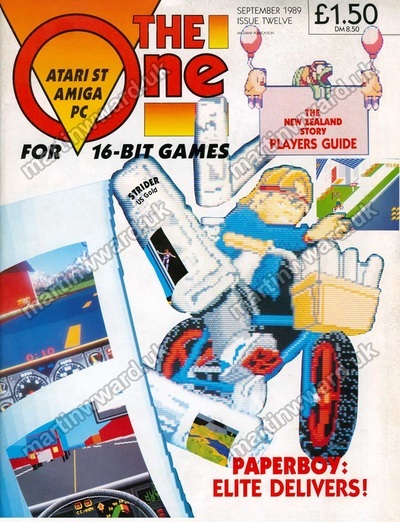 This is rewarded with the addition of an extra subscriber on the following day's paper round. Go for as many broken windows, etc. as possible, as these build up the bonus total which is added to the points total at the start of the target course. Be careful not to throw papers wrecklessly. 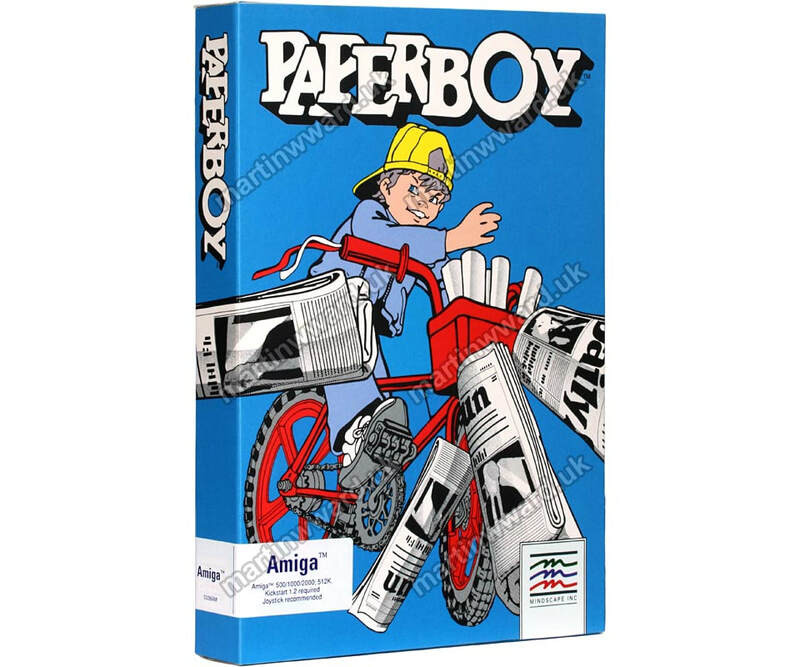 Make sure that there are enough for all the deliveries prior to the next newspaper bundle pickup. 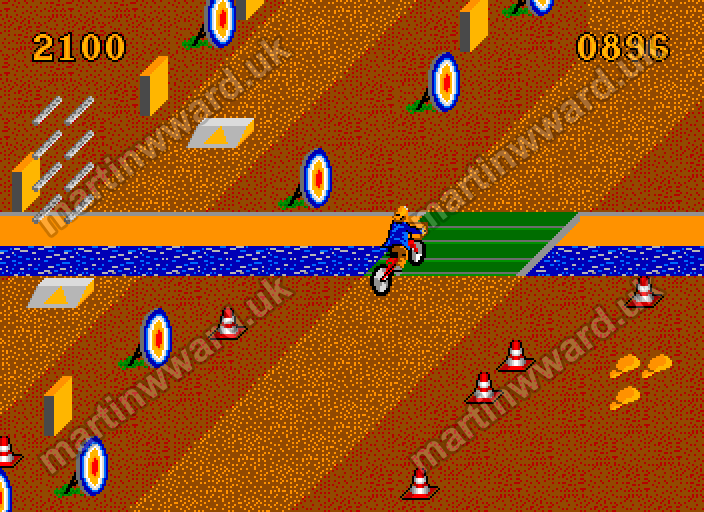 Take care not to ride the bike into the sides of houses or walls, or head on into the kerb. Riding over a drain or manhole cover will cause a fall. Don't bump into anything that moves, as this will also cause the rider to fall off the bike - some hazards may be stopped in their tracks by hitting them with a paper. Hitting any of the people in front of properties with mailboxes will result in them cancelling their subscription - they will not be available for delivery on the next day's round. Ride flat out - do not slow down. Throw papers only at the targets - no points are scored for breaking the orange blocks. Riding the bike over the ramps replenishes the supply of newspapers. The Amiga version features many enhancements over the Atari ST version, on which it is based. 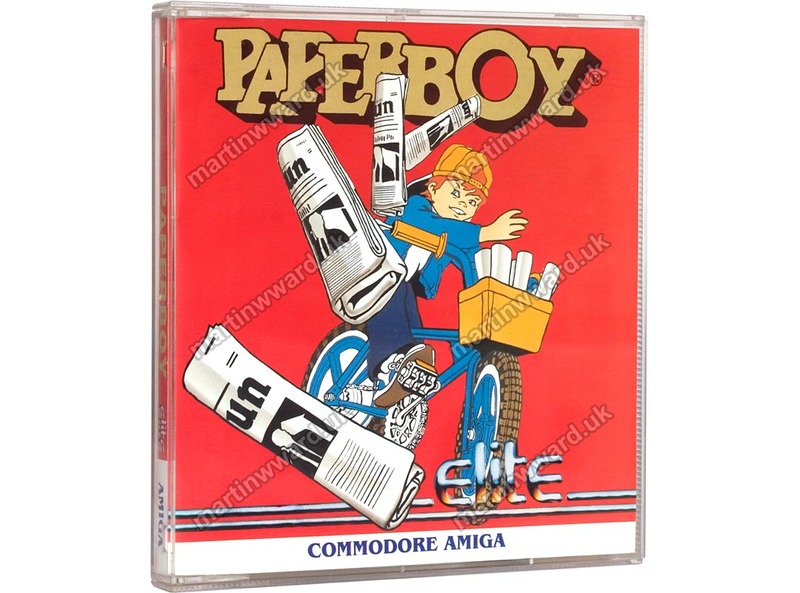 Martin fully exploited the superior hardware of the Amiga to give the game super-smooth, 50 frames per second PAL, full screen (overscanned) diagonal scrolling, giving an effective screen resolution of 352 x 256 pixels. 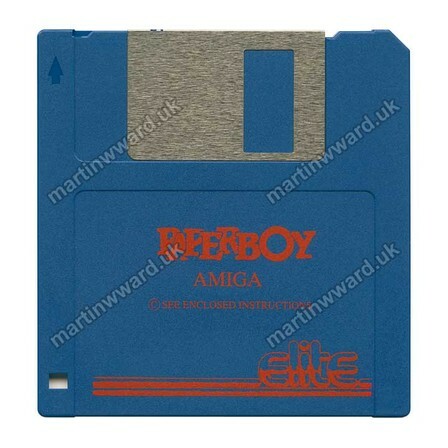 The Amiga game also has enhanced multi-channel music and sound effects. 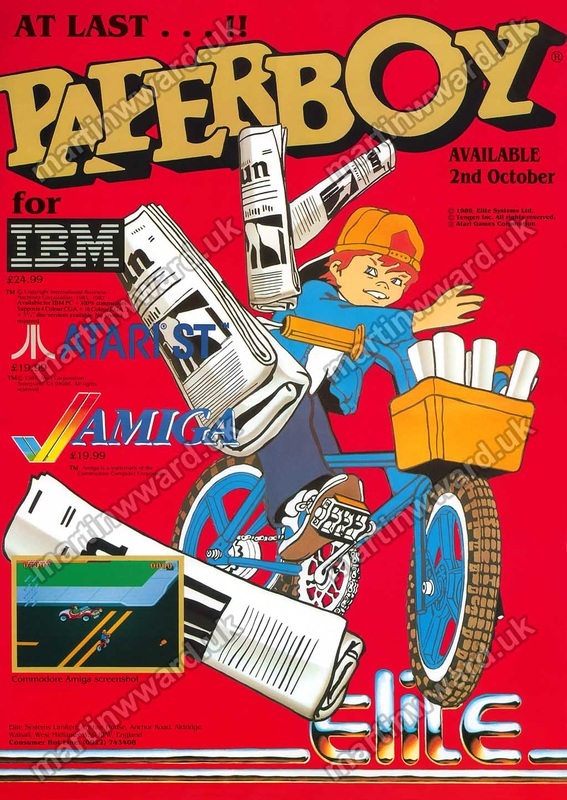 Paperboy Amiga was marketed in the USA exclusively by Mindscape Inc. 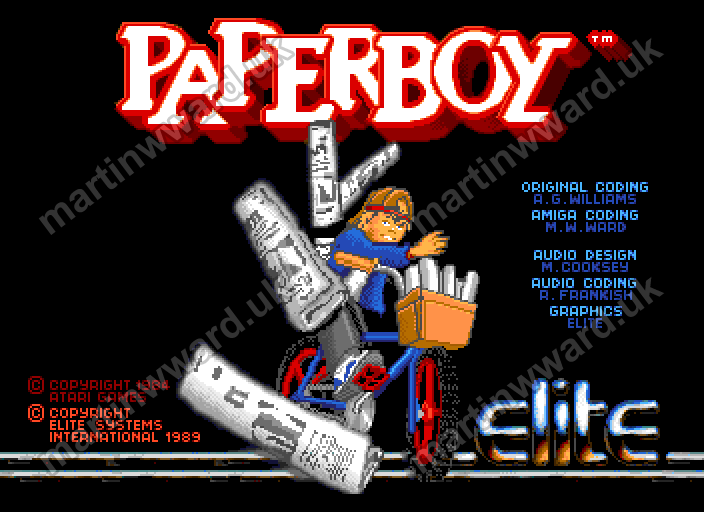 In 1990, Paperboy Amiga was re-released on Elite's budget Encore label. This involved the production of new packaging.